By breaking the bow of Rudra, Rama proves his strength and prowess and qualifies to marry Seetha. Subsequently, a royal alliance is scored between the two kingdoms [Ishvaku and Videha] by Viswamitra and Vasishta, as a result of which all the four brothers get married to the Videha family at the same occasion. Seetha gets married to Rama. Lakshmana marries her younger sister Urmila. Bharata and Shatrugna marry Mandavi and Shrutakerti, daughters of King Kushadwaja who is the brother of King Janaka. King Dasaratha and the royal household, along with a whole mass of people from Ayodhya, undertake a merry march to Mithla to witness the grand occasion. This march is captured in good amount of detail in Kambar’s version [எழுச்சிப் படலம், சந்திரசயிலப் படலம், வரைக்காட்சிப் படலம்]. Pullamangai portrayals include two panels related to the royal union. Both are identical in nature. One might be considered to depict the marriage of Rama and Seetha and another that of Lakshmana and Urmila. The visit of Dasaratha and the marriage of Bharatha-Shatrugna are not featured. Both panels feature two identical sets of figures in approximately same location and posture. However, the anatomy and body language of the characters as well as the quality of sculpting vary significantly. The first one can be considered to represent the marriage of Lakshmana and the second one that of Rama and Seetha. From a sociological perspective, these panels are one of the rare specimens of Chola age – confirming the age old practice of taking the marriage oath in front of the holy fire [Agni]. The bridegroom is a dominant figure in the panel. Pointing at the fire in front of him with his right hand, he is in the process of taking the celestial oath. His left hand is firmly holding his would be wife. His smile is vivid and elegant. Knotted in Jatamakuta, he is adorned with Patra kundalas, Necklaces, Yagnopavita and Udharabhanda. By shaping him in relatively large proportions, the sculptor emphasizes the importance of the character. The bride, who has given her left hand to her would be husband, is still shy and unaccustomed to the male companionship she has been subjected to. She is placing her right index finger in her ears, as a mark of reserve and inhibition. Females exhibiting such gestures are seen in some earlier pallava sculptures as well. Her headdress is styled in Kuntala and she is wearing Patra Kundalas in her ears. Rest of her ornamentation details are not clear. Smaller and leaner in proportions to that of her groom, she elaborately displays her feminine features. The celestial alter with flames rising up, is shown in the middle. Two priests are seen to the right side the fire, engaged in the rituals. First one seated near the fire is holding a sacrificial ladle in right hand and is offering ghee. He should be considered as the chief conductor of the sacrifice. It is noteworthy that he is shown in Garudasana posture. In one of the earlier panels [Pullamangai No. 5], Sage Rishyashrunga, also conducting a sacrifice, was shown in similar posture. These two panels seem to suggest that the chief priest of any sacrifice should be seated in Garudasana posture. This detail in missing in literatures. 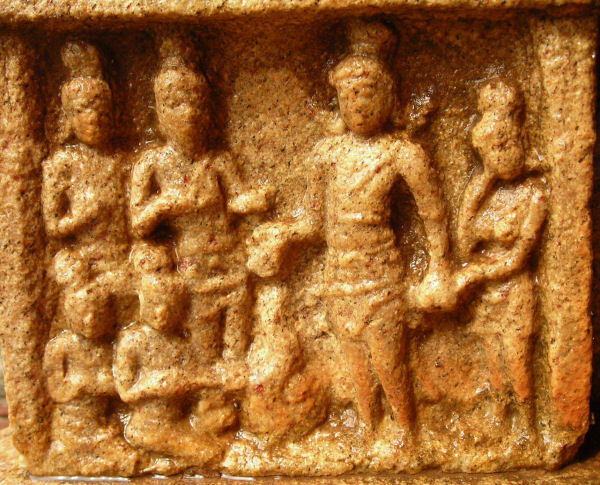 Viswamitra and Janaka are shown in the background. Their hands are raised – but the gestures are not clear. Both are in conversation - happily witnessing the ongoing marriage. As mentioned earlier, this panel is an interesting variant of the former. The characters and postures are the same; however the figures are slenderer and features sharper. The tall and dominant bridegroom is seen to the left of the fire alter. Portions of his face and chest are worn out; but his overall features are well preserved. Gently holding his would be wife in left arm, he is in the process of taking the marriage oath in front of the fire. His right hand is showing a gesture which is not very clear. Wearing a Jatamakuta, Udharabhanda and hip belt, he is gracefully presenting himself to his would be and the rest. The bashful bride, overtaken by a sense of joyous reserve, is unable to contain her feelings. Having given her left arm to the groom, she is tilting her face and smiling – placing her right index finger near her ears. A slight bend seen in her left leg is the charm of a master sculptor – providing grace and elegance to her feminine build. The alter carrying the sacrificial fire is shown in the middle. Two young priests conducting the rituals are seated to the right. The chief priest is seated in Garudasana. His right arm is in the process of pouring ghee while the left is held in Pataka, denoting adoration. The second one is closely behind him – seated and showing Kataka in right hand. 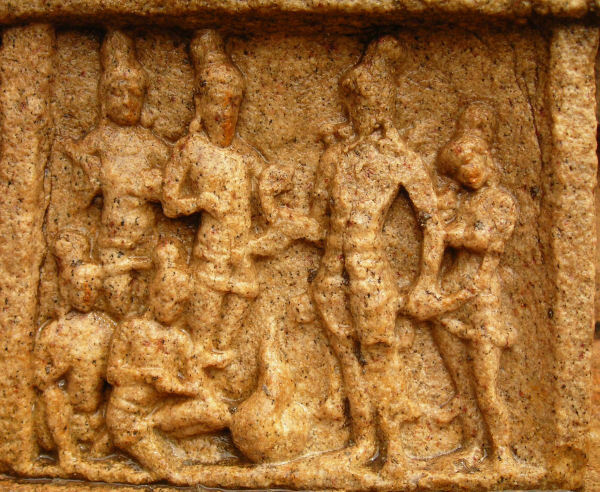 The appearance of the priests is in close resemblance to the two young rishis seated in Garudasana on either sides of Lord Brahma in the Northern Vimana Devakoshta at Pullamangai. One wonders if the artisans at work here had any particular fascination towards younger ascetics and priests. If so, then this might well be the inspiration for sculpting Lord Brahma in the Southern Lingothbhava group as a resourceful youth – thereby rendering an eternal masterpiece. Sage Viswamitra and King Janaka are seen in the background - behind the priests. Viswamitra is clad in a high Jatamakuta and Patrakundalas. He is pointing at the fire with his right arm while resting the other in his thighs in Katiyavalambita. Janaka is standing behind Viswamitra as a happy father. The headband (Senni) is dominant in his headdress. His gestures are not very clear. He is in conversation with the Sage. In total, there are six characters in these panel. Two of them are on one side and the rest are on the other side. The sacrificial alter with its fire in the middle is a sort of conceptual divider between the two halves. By dedicating one full half to the two most dominant characters in the panel viz. the bride and the groom and leaving sufficient empty space all around them, the artisans affix spectator’s attention to the royal pair. The majestic and confident body posture of the groom is balanced by the tender and feminine features of the bride. The overall sculpting excellence achieved in this panel makes it one of the finest thematic representations of a bride and a groom among all Chola creations. 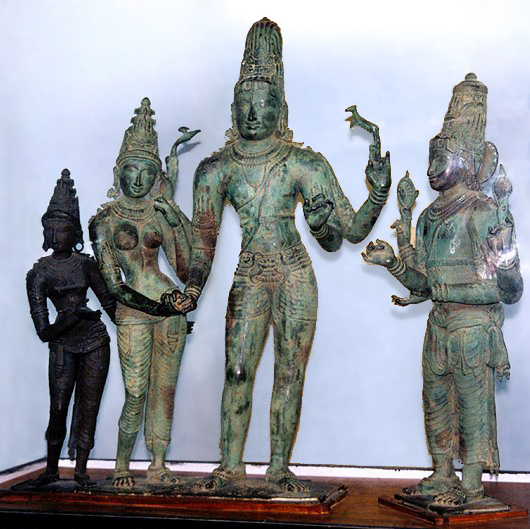 One is inevitably reminded of the bridegroom Shiva and the bride Uma in the world famous Kalyanasundara group of bronzes from Vadakalathur. The four figures to the right of the fire are relatively less important – so they are contained within the second half. 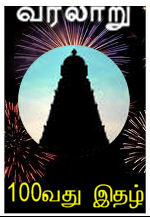 Considering the limited space available, Viswamitra and Janaka are given prominence over the priests. Though both panels contain similar sets of figures in identical positions, their body language and sculptural treatment vary significantly. In Panel 18, the bridegroom is relatively short. His figure is not very slender. The difference in heights between the bride and the groom is also insignificant. Not much empty space is left around the bridegroom; other figures are in close proximity. Overall the personality of the dominant figure is not very well projected in this panel. In striking contrast, Panel 19 presents the bridegroom as a tall, gentle and slender figure. By sculpting other figures at a distance and leaving space around him, the sculptors emphasize the importance of this figure and his prominent presence. Similarly, the bride in panel 19 is a finely sculpted female figure with sharper features as compared to the other one. The delightful nervousness in her physique caused by the male companionship is fittingly represented. The accompanying figures viz. the rishis performing the rituals and the spectators are in fuller attention than the earlier one. Thus, by varying the treatment of sculptures, the artisans strongly suggest that panel 19 involves the marriage of the hero.